Yesterday was the 12th anniversary of the terrorist attacks on the United States. It’s one of those days that will always be etched in my mind – just like when I heard the news that President Kennedy has been assassinated when I was in the second grade. I must admit, though, that the date sneaked up on me; I don’t pay a lot of attention to the dates in my Polish housewife life. There was no advance mention as I know there was in the states. It didn’t make the news on BBC until 2 PM in Poland when memorial events became to happen in NYC. September 11, 2001 started out like any other day for us. There’s a three hour time difference between Arizona and the East coast that time of year (we don’t do daylight savings time), so the news came pretty early in our day. Ed had already left for work and the girls were getting ready for school. I was in the living room when my daughter, Lauren, stuck her head out of her bedroom. She’d been listening to the radio and said, “I don’t know if they’re joking around or what, but they just said an airliner flew into a skyscraper in New York City.” The target audience of the radio station in question would be high school and college aged kids, so irreverent pranks were their trademark. I don’t remember much of what my aunt said that day about her life in Brazil. I do remember her saying about the day’s events, “It makes you glad you know the Lord.” The church opened its doors more than Sunday that week – with quickly planned, services of remembrance and reflection, candle lighting, and offerings to support disaster relief efforts. We all tried to carry on as close to normal as we could, but the devastation in NYC, the Pentagon, and in Pennsylvania were all anyone could think about. That and wonder what might be coming next. As many Americans were posting memorial type photos yesterday on facebook or commenting about how they heard the news, a friend posted that yes she remembered September 11th, and also rattled off a bunch of other important dates in US history and said she remembered all of those too. It struck me as very flippant. I guess for me the difference between September 11th and December 7, 1941, the date of the attack on Pearl Harbor, is that I didn’t live through the events of World War II. To me it’s history, important and worth remembering, but there’s more of an emotional detachment when you weren’t part of it. This is leading me to the second part of my topic – marketing. On my long list of things that are different in Poland, marketing and holidays. September 11th isn’t a holiday, but a discretionary day of remembrance called Patriot Day and National Day of Service and Remembrance. Many individuals and charities make a point of doing something good for others on that day. This year, some businesses are using it as a springboard for a marketing campaign. AT&T, a phone company, shared this photo on their facebook and twitter accounts yesterday. 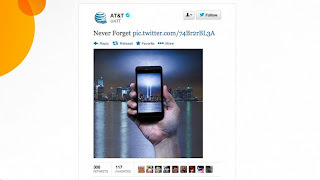 It was removed after being criticized for using the tragedy as a marketing opportunity. This golf course said it was the third year they’ve run this ad. After comments on facebook about their tasteless promotion, they said they would still honor the price and donate the difference between $9.11 and their normal fees to the 9/11 Memorial, hoping that people would see it in the positive light they had intended. This newspaper offered a special for anyone subscribing or renewing on September 11th. It has been pointed out that this rate is more than 1/12 of their annual subscription, so folks taking advantage of it are actually paying more. There’s nothing new about all this; it is so American! It’s very sad to say that most holidays have become just a day off from work, unless you’re in retail or a hospitality related service industry. For those businesses, it’s a chance to increase sales because of everyone else’s leisure time. After Ed retired from the Air Force, he became a member of the PGA and worked at a golf course. I’m here to tell you golf courses in the US are open on holidays. Thanksgiving – why not have a tournament before the turkey meal? Christmas – everyone wants to try out the new clubs from Santa. Easter – all kind of cute decorating options for the clubhouse. My mother worked in retail so Christmas Eve and the day after Christmas were mandatory work days; it didn’t matter if you had family visiting from the other side of the country. One of our daughters is working retail now. The thought of bringing our daughters here for a Polish Christmas – it’s not possible. A recent survey found that many American teens don’t know the history of the 4th of July. Twenty percent didn’t know from which country we were declaring our independence. 14% thought it was France. Au contraire! Memorial Day is seen by many as a three day weekend marking the beginning of summer and of course a chance for giant sales promotions at the shopping mall (or galeria in Polish). It’s really a day to honor our nation’s war dead. Why are we not offended by this, but we are by 9/11 promotions? Proximity, is the only reason I can come up with. 9/11 is still fresh in our minds. It may be that my lack of fluency in Polish serves as blinders, keeping me from seeing what is really going on. It doesn’t appear that Polish holidays are commercial. Many are church holidays. Everything will be closed, except hotels and movie theaters. Flags fly on public transportation vehicles, cars, and balconies. Time is spent with family and meals that last all day. Cemeteries are cleaned and decorated. I think the United States could do with some of this. My final observation on Polish holidays – they aren’t arranged to fall on a Monday, but they sure do turn into long vacations. A holiday on Friday or Monday, of course, gives you a three day weekend. Thursday or Tuesday, even better, let’s turn that into a four day weekend. Wednesday? Lookout – a nine day weekend! PS – just after I posted this, I found a link to this Budweiser ad on facebook. They make crappy beer that is surprisingly popular in my homeland, but in this ad I think they walked the fine line between a moving tribute and selling a product. It was originally intended to run only once, during the Super Bowl early in 2002. It ran again one other time of the tenth anniversary of 9/11. Now, thanks to You Tube, it will run forever. I've often wondered if stores in other countries turned every national holiday or day of remembrance into a sales opportunity. I'm glad to know they don't, but it sure makes me ashamed of the retailers in the US.